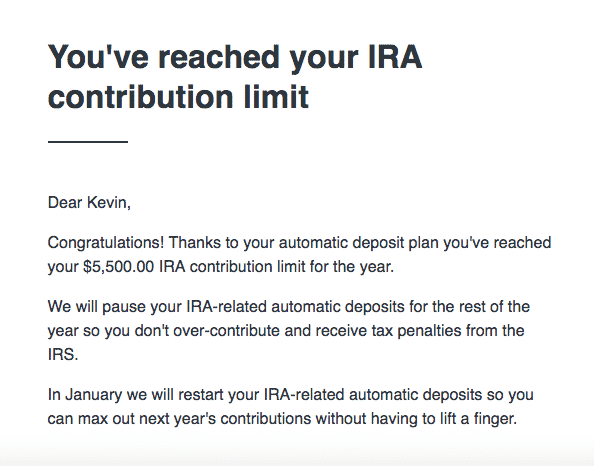 A few days ago, I received an email from Betterment notifying me that I had maxed out my Roth IRA for the year. It marks the third year in a row that I’ve maxed out my Roth IRA. Maxing out my Roth IRA might not seem like all that big a deal, but I think it is when you consider that three years ago, I didn’t even know what a Roth IRA was, let alone how to start or invest in one. At the time, the only investing I had done was a small, automatic contribution from my paycheck to my firm’s 401k – the default amount that my firm opted everyone into unless you specifically opted out. When I did eventually get around to starting my Roth IRA, I went with the robo-advisor route. I chose to use Betterment since it had a low minimum contribution amount, the fees were reasonable and transparent, and the interface was straightforward and intuitive. Even though I had read that it was slightly more expensive to use a robo-advisor and every investing person online said I could do the same thing myself without the added fees, the ease of opening up a Roth IRA using a robo-advisor made it worth it. Plus, I found comfort in knowing that my contributions were being properly invested by a fiduciary. After three years and $16,500 in contributions, I’ve now outgrown my Betterment account (at least when it comes to my Roth IRA). While the 0.25% management fee that Betterment charges isn’t very high, I’ve learned enough about investing and have enough saved up that I don’t really need the robo-advisor element anymore. As a result, this year, I’ll be transferring all of my Roth IRA funds directly over to a Roth IRA with Vanguard. The move should cut my overall fees down from somewhere in the 0.35% range all the way down to 0.04%. It’s a pretty big cost savings over the long term. Though I’ve outgrown my Betterment account, when new investors ask me where they should set up their Roth IRA, I still generally say to start with a robo-advisor – Betterment or Wealthfront, in particular. The way I see it, when it comes to a Roth IRA, start with Betterment or Wealthfront. Graduate to Vanguard later. *Note: This post isn’t an advertisement for either Betterment or Wealthfront. Indeed, I haven’t even included any affiliate links in this post. I simply suggest these two because they both are low cost, have low minimum deposit requirements, and allow you to transfer to another brokerage later down the line for free. For a lot of us in the personal finance/financial independence community, investing seems pretty simple – invest in low-cost index funds that match the market, save a huge percentage of our income, and let that money grow over time. As easy as we like to think it is, the actual process of investing isn’t all that easy for the new investor. I know this because I was in that position once too. It took me a while to learn this stuff. And even now, a lot of you took for granted that you understood what I wrote in the previous paragraph. For someone like me three years ago, that last paragraph might as well have been gibberish. Where do you open a Roth IRA? How do you put money into it? What happens once that money goes in? How much do you need in order to invest? Throw that list of questions in someone’s face and most likely, they’ll just decide not to do it at all. That’s why I’ve always been a huge fan of robo-advisors and why I started out my investing life with one. They answer those questions for you. All I had to do was open an account, deposit money into it, and then the robo-advisor (Betterment in my case) did the rest for me. What makes the robo-advisor route so helpful for the new investor starting out with their Roth IRA are the fees that aren’t charged. Let’s look at management fees. Management fees are the main problem most people have with going the robo-advisor route. The nice thing though is that there are robo-advisors that will manage the first $5,000 or $10,000 you invest for free (Wealthfront, in particular). Since Roth IRA’s are naturally limited in how much you can put into it in a year, it’ll take you 1 or 2 years before you’re in a position where you’re even getting charged a management fee. By that point, you can go ahead and move your funds directly to Vanguard, if you want. The other fees to consider are closing or transfer fees. 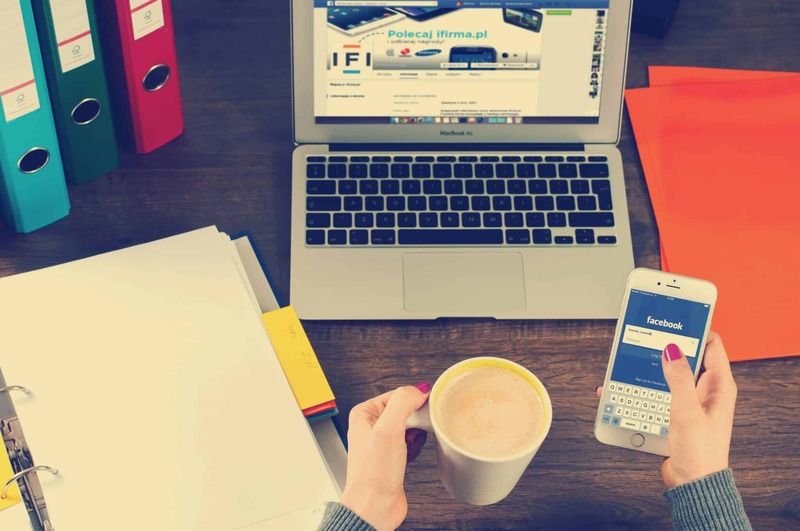 One issue with starting with one brokerage account and then moving to another account is that you’ll often get charged fees to transfer your funds to another brokerage. That makes picking the right brokerage sort of important. Wealthfront has the same policy as well – no fees to transfer your account from Wealthfront over to another broker. What this means for you is that its easy enough to start your Roth IRA with a robo-advisor first, just like I did. You’ll pay either zero or very minimal management fees on a small amount of money. After a few years, you’ll have $10,000 or more saved up in your Roth IRA. At that point, you can just transfer it out and go with investing directly with Vanguard. So which robo-advisors do I recommend? I see two that make this tactic of starting with a robo-advisor, then moving to investing directly with Vanguard worthwhile. No fees to transfer your funds over to another brokerage. No minimum investment, which means you can get started with investing right away. The management fee is 0.25% starting with your first dollar, which is reasonable. Again, no fees to transfer your funds over to another brokerage. There is a $500 minimum investment, which is a slight barrier to entry. The management fee is 0.25% but is waived for the first $10,000, which makes it pretty perfect for starting out your Roth IRA. If I could go back in time, I probably would have set up my first Roth IRA with Wealthfront, simply because of the free management on that first $10,000 (really $15,000 since, if you use anyone’s referral link, you get another $5,000 managed for free – feel free to Google for one or hit me up if you need one). Most people will take around 3 years to get $15,000 into a Roth IRA, so it’s basically the perfect spot to get started and use this tactic of starting with a robo-advisor, then moving on to investing directly with Vanguard later. You’ll hear from a lot of experts who tell you that you can do all of the stuff that a robo-advisor does on your own for free – and they’re absolutely right. But doing it yourself naturally increases friction, which makes it harder to get started. Instead, I think it’s better to get started right away with a robo-advisor, then move those funds to Vanguard once you’ve figured out what you’re doing and have a little bit of money saved up. Even if you pay any management fees to a robo-advisor on your Roth IRA, it’s not forever. Sure, I paid three years worth of management fees to Betterment – three years that I probably didn’t need to pay any fees. Three years, though, isn’t a ton of time in the grand scheme of things. So, I’ll be doing two things this year when it comes to my Roth IRA. First, I’ll be moving my Roth IRA contributions directly into Vanguard. With three years of contributions and a long bull market, my Roth IRA is now standing at a little over $21,000. I’ll likely be dumping it all into a Vanguard Total Stock Market Fund (VTSAX) just to keep things simple. Transferring my funds into Vanguard shouldn’t be difficult either – companies are always willing to help you get money to them, so it’ll just be a matter of opening up my Roth IRA and figuring out some directions. The second thing I’ll be doing is opening up a Roth IRA for my wife and getting as much as we can into her Roth IRA for tax-year 2017. We’ll be opening up her Roth IRA with Wealthfront since the first $10,000 is managed for free and it only requires $500 to get started. In a few years (possibly even this year), our income will be too high to directly contribute to a Roth IRA, at which point, we’ll have to start utilizing a backdoor Roth (a topic for another post). I’m not quite sure if robo-advisors can work with backdoor Roths, although I don’t see why they wouldn’t. It’d just require a little more manual work. I’ll probably follow up on that topic in a future post one day if my income ever gets to that point and I’m still robo-advisoring it up. Anyway, that’s the strategy I recommend for anyone starting out their Roth IRA investing journey – go with a robo-advisor first, then move those funds into Vanguard later. It’s an easy way to get your investing life off to a good and easy start. I’m early retired and I still let three robo’s manage my accounts because I don’t like to do it. That is in spite of my helping manage a $60mm endowment fund for a charity I volunteer at. When it comes to my own money it is worth the management fees to not have to think about it and it is an affordable cost in my budget just like my CPA. I feel like at some point I might take over the management of my portfolio but right now it is a luxury I choose to pay for. Very interesting! It always seems like the Bogleheads and other people who know what they’re doing with investing recommend against robo-advisors simply because of the fees, so it’s good to see someone knowledgeable using them too. I’ve personally always thought the fees were perfectly reasonable and that they’re perfect for someone just starting out investing (college student, recent grad, etc). I remember when I tried to start investing back in college (around 2007 or so). I set up an E-trade account and had no idea what I was doing – then gave up and stopped investing for 8 years. Honestly, my investing life might be totally different today if robo-advisors had existed back when I was in college. I might have started investing when I was 20, instead of 28. My whole thing with robos is they just help people get started, which is way better than doing nothing. Do you use your robo-advisors just for taxable accounts or tax-advantaged accounts? (I’m guessing probably taxable accounts?). I can definitely see a benefit with robos for taxable accounts with the tax-loss harvesting. I do see a value with robos for taxable accounts with the tax-loss harvesting, although, as you mentioned, you need to have a real amount of money invested before it makes a difference. Having it in taxable does make it problematic since you’ve got to worry about taxable events. It looks like Vanguard funds could be transfered in-kind to Vanguard in full shares, but then you’ll have to use ETFs for your Vanguard account, which you might or might not want to do (more of a hassle to use ETFs unless it lets you buy partial shares of ETFs). Let me know what you end up doing with that taxable account. I’d personally probably just leave it at Betterment. Maybe take advantage of that financial advisor service that they offer to get some more return on your fee too? I do think that when doing this Roth IRA to Vanguard strategy, Wealthfront is probably the way to go. You can basically start out doing Wealthfront for free, then make your decision down the line, then move onto directly with Vanguard later if you want. That’s the nice thing about the tax-advantaged account – don’t have to worry about the taxable event issue, which makes the robo-advisor route to start even better. When you started your IRA with Vanguard, did you buy ETFs or did you wait until you had enough saved so you could invest into a fund? I’m also considering doing the reverse. Have a long standing account w/ Vanguard, but I’m so happy with the Wealthfront service that I might be moving a chunk of that over to Wealthfront. I’m not crazy about some of Vanguard’s user interface and reporting on their website. I had ended a long standing account I had with American Century because their technology offerings, in the form of their site, simply was not keeping up with the times. That’s a BIG selling point with me, and Wealthfront seems to be doing it right and tweaking it all the time. Good post. Congrats on maxing out your contribution! I know – the tech thing is what these robos are doing so well. My buddy initially set up a Roth IRA with Vanguard and couldn’t figure out what the heck he was doing (smart, tech-savvy, brand new investor, didn’t know how to invest his money). I ended up just telling him to open a Wealthfront account so he could just put it in and walk away. The robo interface made it much easier for him. Are you able to use Vanguard with Chrome? I constantly get the blank gray screen of death and have to remember to use FireFox just for Vanguard — ugh. Wow, this was exactly my plan. I am new to the investment game so I opened up my first Roth account with Betterment two months ago! Thats perfect man! Now just keep doing regular contributions and in a few years, reassess if you still want or need the robo-service/interface. It’ll take you some time before you have significant money in there anyway. And don’t get scared off by the market fluctuations! I’ve done a few rollovers with Vanguard and they are amazing. I took an old 401K and rolled it into a roth IRA and they not only helped me through the whole thing, but they told me to pay the tax out of pocket to avoid the penalties. Good luck, but you most likely won’t have any problems moving your money. Yep, not expecting any issues at all! Any reason you rolled over the 401k into a Roth? I’m guessing you were in a low tax-bracket and it wasn’t a huge 401k? At the time, I only had a Roth IRA account and the old 401K was less than $5K. I just wanted it all in one account and the taxes weren’t going to break the bank. I ended up just taking a smaller refund that year and I simplified everything by having it in one account. That makes sense! I likely would have done the same thing, especially since you were getting a tax refund too. I did this exact same thing. Started out at Betterment and moved it over to Vanguard as I learned more! Thanks for doing that math Graham! $62 bucks for 3 years just so you can get your Roth IRA started, then switching over to Vanguard. That is well worth it. Seriously, if robo-advisors had existed for me back when I was 20 years old, things would have been SO MUCH different. I think Wealthfront is doing away with the first $5,000 managed free (grandfathering existing accounts), but keeping the 5k free for each referral. I love WF – yes, I could do it myself, but I wouldn’t. And the thousands I’ve banked in tax loss harvesting feels like free money. Yep, I saw that email too noting that Wealthfront was getting rid of the first 5k for free. Luckily, we got grandfathered in for my wife, so she’s got something like $20k managed for free, which should take her about 4 years to get to that point for a Roth IRA. I took your sage advice and opened up a Roth IRA with Wealthfront. However, I didn’t know until recently that since it’s before April 15, I could put in the $5,500 max contribution for 2017, and then $5,500 more for 2018. If I do them simultaneously, it puts me over the $10K limit almost immediately, so am I better off transferring these funds to a Vanguard and nixing the Robo-Advisor completely? If not, how long should I plan on leaving the ~$11,000 in Wealthfront for? If you’ve got the cash already to do that, then you could just ignore the robo-advisor route and just go straight to Vanguard. It’s not a big deal either way. Just get started is the most important thing. Kevin, do you think you could do a blog post detailing step-by-step on how to use the Vanguard website to invest in their mutual funds and/or ETFs? I think that’d be incredibly beneficial. That’s a great idea. I have a post planned on the process of rolling over my Betterment account to Vanguard, so I could probably just add that as well. Yo Financial Panther! I definitely see the advantage in “retiring” from the robo-advisor and going straight to the Vanguard account. It is really hard to beat that .04%! Did you look into any of these now free robo-advisor apps? Like M1 or Robinhood? I like M1, and I honestly haven’t done much research into Robinhood so I’m not sure if you can even buy Vanguard ETFs with it. Anyway, for someone like yourself, you can definitely do better getting round that fee since you are a sophisticated investor. I’ve never looked at M1 before, so not sure how they work. Robinhood is not a roboadvisor – it’s a brokerage basically that lets you buy and sell for free. You could, if you wanted to, buy Vanguard ETFs through Robinhood, but I’m actually not sure if Robinhood lets you set up tax-advantaged accounts or not. PoF featured one of your posts and after reading it I came to your blog to peruse your thoughts. So, this response is a few months time late, but I have to say your approach here makes little sense to me. It probably won’t hurt anything to start a Roth this way, but why introduce the complexity? Open a Roth at Vanguard, set up automatic payments to invest in one of the low cost target retirement funds (that take care of asset allocation over time) and forget about it. Hard to make investing any easier than that. I’m curious, what advantage do you see to starting with one of the wealth advisors? I get that you can do it, I just don’t get why anyone would want to, especially if the end game is to get to Vanguard within a few years anyway. Hey Larry, it’s a fair question – I had a debate in a lawyer chatroom with my buddy BigLaw Investor (and others in the room) about this exact topic. Some agreed with my approach. Others thought going straight to Vanguard and doing a Target Date fund made sense. Here’s my rationale. I think roboinvestors are great places to start off with a Roth because the vast majority of people have absolutely no idea how to start investing. We’re all in this investing world so much that we take it for granted just how much of an understanding we have. Go to 99% of people out there (and go to 100% of college kids probably) and none of them will know what a mutual fund is or anything really). Here’s my own history. 10 years ago when I was in college, roboinvestors didn’t exist. I had read about Roth IRAs from reading automatic millionaire, so I thought, I’ll start one of those up since I was saving some money and I thought it made sense to try to save for retirement like the book said. I ended up opening an account with etrade, and then…I had no idea what to do after that. Since I didn’t know what to do, I did like what most people do, I gave up, then didn’t start investing until 8 years later! One thing I could do though was save money in a bank account. And the advantage of roboadvisors is that its basically the closest thing you can get to a bank like savings account experience with investments – move money into a Betterment or Wealthfront account and then that’s all you have to do. If you go and tell most people (even smart, educated people) to go start up a Roth IRA and invest it all into VTSAX or a Vanguard Target Date fund – that’s basically assuming people understand those words. I don’t hang around dumb people. But if you told my wife to go open a Roth IRA right now, she would not be able to do it. I would literally have to sit there with her and do it for her. And she’s a dentist that’s gone through 5 years of college and 8 years of post-college schooling. She knows a lot about teeth, but she doesn’t know anything about investing. But if I tell her to go to Wealthfront and open a Roth IRA there, she knows exactly how to do that. Obviously, this approach isn’t for someone who knows what they are doing. It’s why I wrote this post. It’s for someone like me to get started, then reassess down the line later. Because, they can stay with the roboadvisor too. What’s important is that they got started until they’ve either learned more about investing (like me) or they don’t know anything and just stay the course where they are. I started off my Roth IRA with Betterment because I didn’t know how to invest and couldn’t understand how to even do anything. Even my Solo 401k, which at that point I did know what I was doing, took work to figure out how to buy something (it’s not intuitive at all). If I had trouble understanding how to use it, how would a regular person be able to figure it out? These roboadvisors charge 25 basis points for their service. We all pay extra for services, that’s why we would be okay with some people paying extra for target date funds, even though you could do the same thing at a lower cost yourself. In my opinion, 25 basis points is not going to be the reason someone doesn’t hit FI. Anyway, that’s my thought. There are fair criticisms. I think that a lot of us just underestimate that, while investing is simple, it really isn’t for most people. So the more “bank like” you can make investing seem, the better. If Vanguard or Fidelity would literally let you open up a Roth IRA, put in money, and then automatically put it into the right spot for you, that would change this whole thing up. Be mindful of wash sales when not doing all your (and your spouse’s) investments at one single robo advisor! Good point. Luckily, if you’re just starting out investing and using it for a tax-advantaged account, no need to worry about any of that. I’ve got a question that I cannot find on the web. it wouldn’t be contributed to after three years. What could be expected for a return after ten years. Hey Jim. The question really is, what are your alternatives. If you’re not doing anything with it, then yeah, you should invest it. 18k over 10 years at 7% rate of return is 35k. It’s not a lot, but it’s double what you put in. Growth comes from big numbers though, not from small numbers. Also, why not just earn some income so you can keep contributing? 6k per year is $500 per month. That requires you to make about $16 or $17 per day. I’m fairly certain anyone can figure out a way to make 16 or 17 bucks per day.